Stage and screen actress Loretta Swit is known to many people from her iconic role as Margaret “Hot Lips” Houlihan in the television series M*A*S*H. Loretta Swit is also a dedicated activist in support of animal welfare. Among her many related activities, she is 1st Vice President of Actors and Others for Animals. Swit is also a painter, and she uses her artwork to raise money for her animal charities. Swit told The Malibu Times that she’s been painting since age six and that she works only in watercolor. She also designs jewely. The image posted here is The Rookie by Loretta Swit. Swit is selling copies of the painting to raise funds for the Search Dog Rescue Foundation. The Search Dog Rescue Foundation trains rescued dogs and partners them with firefighters and other first responders to find people buried alive in the wreckage of disasters. 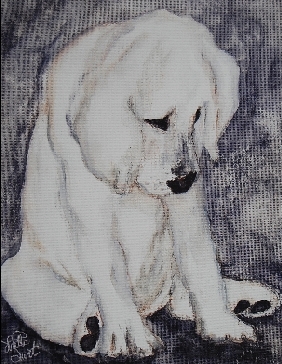 Loretta Swit says that The Rookie painting was inspired by a photograph of a Labrador puppy who would hopefully be trained to be a search dog. To purchase a copy of The Rookie, visit SwitHeart.com. This was written by Lorrie. Posted on Sunday, January 15, 2012, at 2:13 pm. Bookmark the permalink.